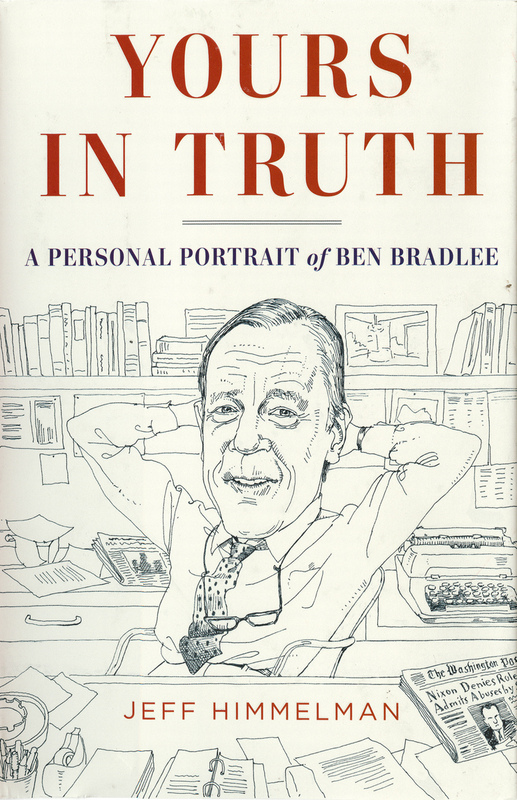 A new biography of Ben Bradlee, legendary editor of the Washington Post, was recently written by Jeff Himmelman and published by Random House. I was commissioned by AD Paolo Pepe to do the cover. 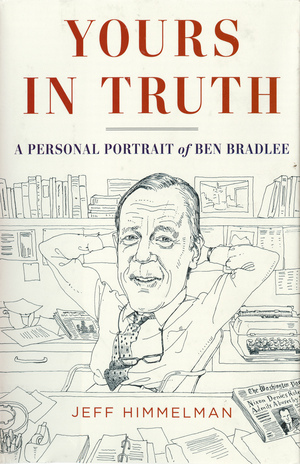 They wanted to depict Bradlee at his desk and there was some back and forth on whether the piece should have color. Because of his association with the newspaper, a b/w image on a newsprint color seemed appropriate. Ultimately however, it was decided that I should do a color piece. When I finally saw the book, to my surprise the color had been removed (along with a bit of hatching under the nose). Such is the magic (and mystery to me) of photoshop. Below are both the color and printed versions. Joe, I can imagine you being angry about the very drastic change in your work when you saw it in print. So did you explode in anger as I would after seeing the book for the first time? Bjorn, I don't know about exploding in anger, I think I've been doing this too long to be that shocked about anything. However, no art should ever be altered without the artist's consent. A while after I submitted the color final I was asked if I still had a b/w version, I didn't. Since I don't work digitally, I'm not in the habit of scanning my work in progress (maybe that should change). So, I had a suspicion that there may have been a problem. Since I didn't hear anything further, I forgot about it and moved on. I'm less troubled by the removal of the color than by removal of hatching lines in the face. I fully understand in these client situations there are time constraints and a number of people weighing in, however the illustrator should always be given the option of making any changes themselves. Hmm. The color is nice, but I think the final b&w version is particularly elegant. [mystified about the removal of the shading, but maybe with all the tone gone, it stood out like a partial Hitler moustache] You should photoshop an extra decimal place onto the paycheck. I agree with Barry. Final b&w version looks great on the cover. Things like this happens sometimes. At the end, it is a really successful result. Although, it would have been nice if the publisher had asked if you wanted to do the photoshop job or not. You probably would have let them do it anyway. It is all about the choices you get. I had similar experience recently, when the illustration was finished before the article was in, and the article at the end had specific colors of the details which were contradicting in the image. Publisher did contact me about it, to ask permission they make changes in house. It needed to go into print right away, and I would not have had time to do it myself. 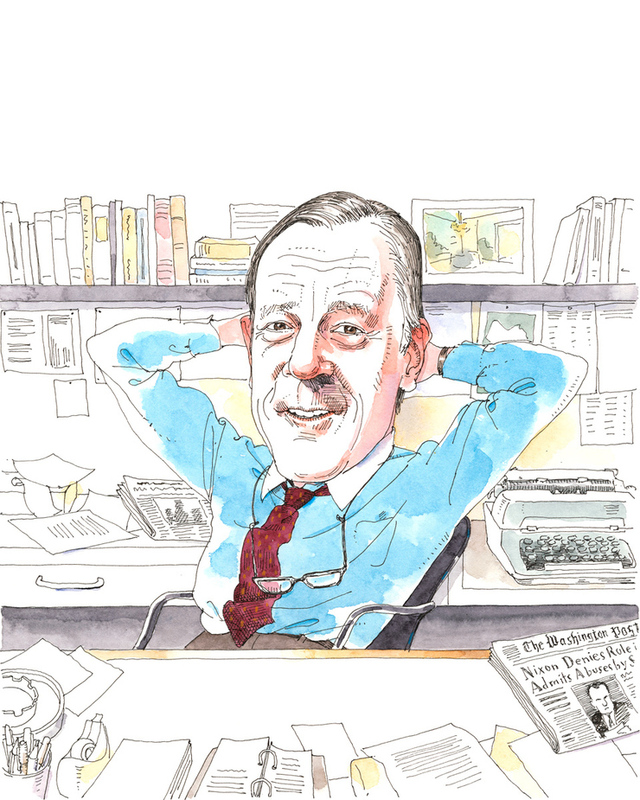 Have to agree with the wise Mr. Blitt. They're both so beautiful, Joe. But the black and the white is particularly elegant--and with that bold, red type--it makes it all feel from a previous, beloved time. At this stage of my life, I high res scan my b/w drawings before adding any color to the originals. Often because I like the b/w drawings on their own. Also, just for possibilities like you describe here. Still, great cover. I think Barry's got a point about the possibility of the Hitler mustache without the color, but it would have been nice to give you the opportunity to adjust that to your own sense of aesthetics. Great cover, Joe. I like how you placed it in time by the headline on the folded newspaper. A bunch of years back I read a great book written by Bradlee, "Conversations with Kennedy", about his close friendship, and discussions he had had, with the President. Obviously, a decade or so before Watergate. A very entertaining read. It's interesting to me that the people who report on current events sometimes become closely associated with those events, like Bradlee, Woodward and Bernstein were with Watergate. I think there's an app for that. 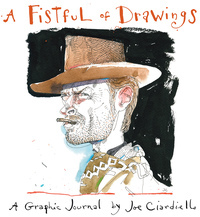 Still a great looking cover Joe and the likeness is still spot on. It's quite the controversial book, what with stuff about hinky details in Woodward's Watergate reporting. And now your color has gone missing? hmmmm.